Is there any point in making suggestions in the Netherlands about how to rebuild New Orleans? Should outsiders even want to offer solutions? Can architecture play a role after a disaster? Aren’t engineering works – dikes, storm barriers, drainage systems, roads, telephone lines – more urgently needed? The other two offices, landscape architects Hargreaves and Adriaan Geuze/West 8, were asked to concentrate on the city park. As big as the Amsterdamse Bos, the park was completely destroyed by the hurricane and salt water. Hargreaves actually thinks that this is the moment to reduce the size of the city but at the same time he says that this is emotionally impossible. The project by Hargreaves is therefore based on the city's reconstruction. A new dam structure is needed, however. The office takes advantage of this new structure to add new public and green spaces to the existing urban fabric. Of all the participants, West 8 addresses the disaster most directly. The park can be used as an emergency district for the time being, the office argues. All the volunteers who come to help clear up the rubbish and start reconstruction have to live somewhere, haven't they? If they are housed in the park, then the rest of the city can be tackled. Moreover, the huge mountain of rubbish deposited in the park by Katrina can be dumped into the sea to create a new island. Once the first wave of volunteers has departed, the big groups of boy scouts who traditionally do volunteer work in the summer can clean up the park, plant new trees, and dig ditches to let the salt water drain out of the soil. And then, in the distant future, it might be possible to think about design – the addition of a boulevard, a jogging track and a garden of remembrance. So what's the point of an exhibition like this in the Netherlands? The American delegation recently escorted to the Delta Works by the Dutch crown prince had already departed by the time the projects were finished. It will be a while before the exhibition travels to America and the residents of New Orleans can take in these often hopeful images. Perhaps the initiative is worth while, though more for us than the Americans, as a warning. If you look at the aerial photos in the exhibition you realise what it means when a city is inundated. The chaos that ensues is frightening: water everywhere, roads torn up, a roofless stadium, cars carried away, telephone and electricity networks down and, above all, water. Salt water. In every street. Just imagine if something like that happened in our land of polders. And that is exactly what Adriaan Geuze was warning us about during his architecture biennial. 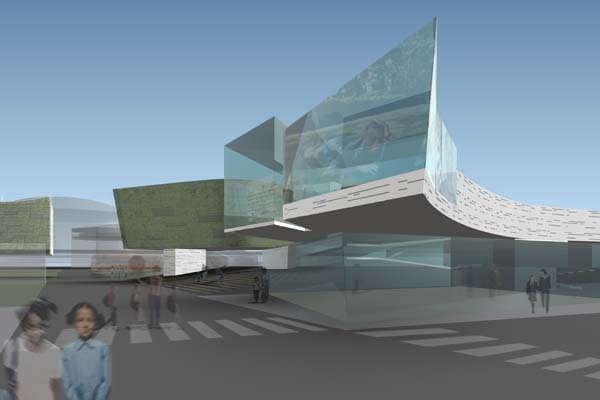 That is also the idea behind UN Studio's proposal. The office run by Ben van Berkel was asked, together with Morphosis, to design a mediatheque that could become an icon for the whole city. Architecture that unites. UN Studio went back to the typology of the ziggurat, an ancient geometric structure with interconnected gardens. Van Berkel, too, connects the public (outdoor) spaces to one another along the façade, creating a host of new views and atmospheres in the process. Did Van Berkel succeed in designing an icon for New Orleans? Put it this way, he did what he does best. The building folds and curls its way upwards, but the substance of the project is thin. Couldn't it have been located elsewhere just as easily? And what does that say about the meaning of an icon? The contribution from Morphosis is much more radical and substantial. Thom Mayne leaves the required mediatheque programme for what it is and concentrates on the reality of the city. 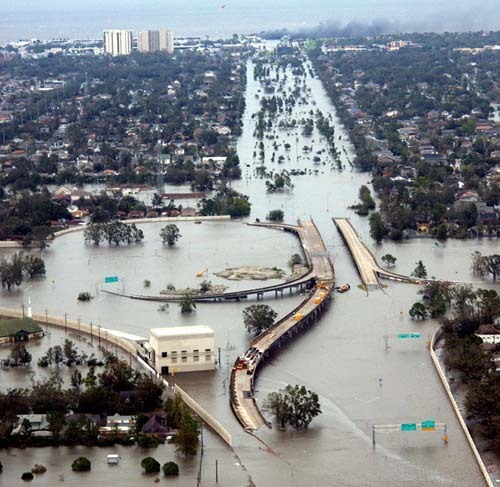 Only 20 percent of residents have been able to return home since Katrina. Moreover, many buildings were vacant even before the disaster. The central government has announced that the city should be smaller. According to Mayne, New Orleans can shrink to 50 percent of its original size. If this is concentrated in 'Downtown' New Orleans, more space can be reserved for the Mississippi in the lowest-lying areas. For the Downtown area Morphosis designed a surface that connects all public functions to one another. A new meaningful space for the city's residents. But this plan doesn't look like it will become an icon in the near future either. And wasn't that the aim? Of all the offices taking part, MVRDV illustrate the two-sided nature of taking on such a commission. The office was asked, as was Huff+Gooden, to design a school for the poor neighbourhood around the notorious Superbowl stadium. But does a Dutch office really have to drop by to say how to do things? Wouldn't it have been better to ask Gehry for example: expensive architecture for the poor? Because the introduction to the exhibition makes that clear. After all, when the dikes gave way and water flooded the city located four metres below sea level, it was the poorer black districts that suffered most from the poorly organised rescue effort. The good thing about the MVRDV presentation is that it reveals its doubts in taking on the commission. The office sought contact with Huff+Gooden, which received the same task, to set up a dialogue about the American effort. 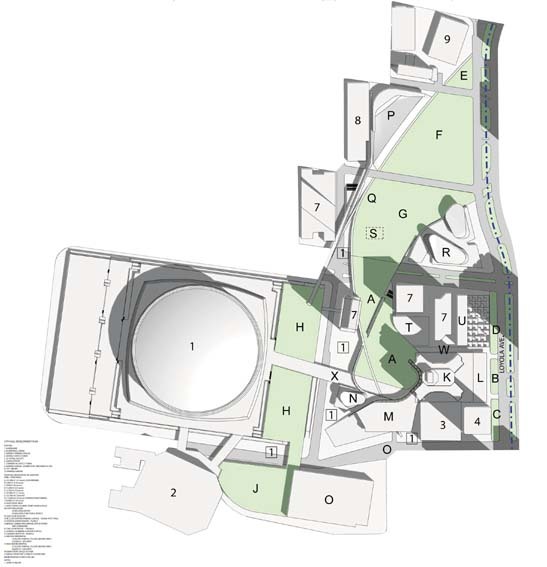 The proposals are shown opposite each other, with the models in between. What's more, MVRDV exhibit the email correspondence between both offices as well as many, often cynical, sketches. Whereas Huff+Gooden eventually opted to design a school arranged around a street (a type based on the famous French Quarter in New Orleans but executed in a modern design language), MVRDV designed what is a fairly literal yet very charming child's dream. The big hill that everyone can climb and in which the programme above sea level is contained, is a translation of a child's drawing. The classrooms protrude from the hill and have their own big verandas. Located on the top of the hill are sports facilities and a skate bowl, which can also be used by residents of the surrounding neighbourhoods. For that is the idea: to add to the city a place that brings people together. 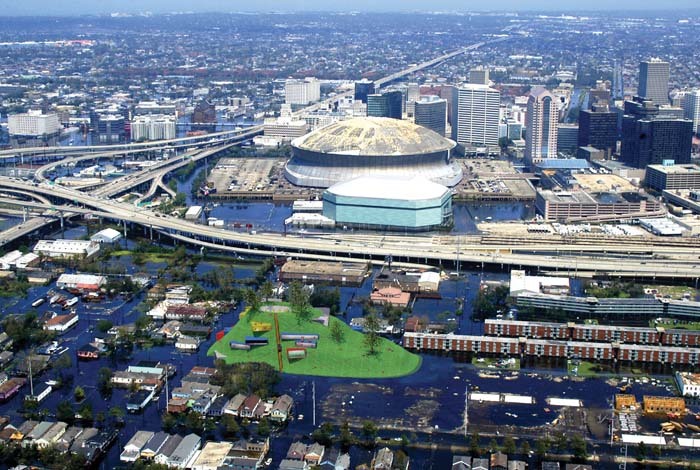 These are relevant questions that even the curators of the exhibition Newer Orleans – A Shared Space asked themselves when Reed Kroloff, dean of the architecture faculty at Tulane University in New Orleans, asked the NAi to help create future scenarios for the badly hit city. New Orleans, according to Kroloff, was badly in need of images. There was plenty of work being done on the technical side of things, of course, but those are largely invisible. Architecture, on the other hand, would be capable of producing images of hope for the future. Locals themselves can't do it, because the local academic structure was destroyed by the hurricane. Students and staff from Tulane University have been relocated to other universities or released. A good reason, therefore, for the NAi, the NIROV and the magazine Artforum to take on the challenge. The task of deploying design power went to Dutch designers Ben van Berkel (UN Studio), Adriaan Geuze (West 8) and MVRDV, and the Americans Tom Mayne (Morphosis), Hargreaves Associates and Huff+Gooden. The exhibition begins with analytical maps and a photo taken the day after Katrina. On display in each of the aisles of Gallery 3 of the NAi is the work of one Dutch and one American office, both of whom were given the same assignment. Though naturally not the theme of the exhibition, the differences between each pair of projects is striking. Dutch designers still set about the task in a very conceptual and image-based way – images that linger in the mind but that are still somewhat superficial. 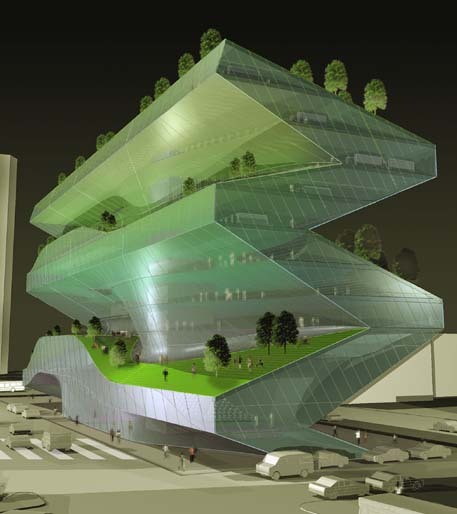 The American offices, Morphosis in particular, address the problems facing New Orleans in a more substantial manner. On the other hand, the final images produced by the Americans possess much less iconic power.